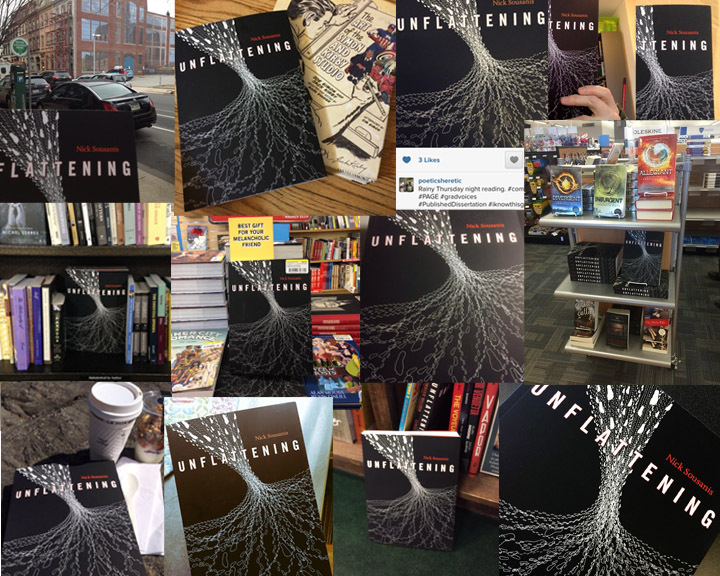 A fun week of early feedback, as people have been sending me pictures of Unflattening on bookstore shelves and arriving in their mail! I appreciate all the support and look forward to conversations to come over the work. It’s been sighted at The Strand in NYC, Tattered Covers in Denver, Quimby’s comics in Chicago, and alongside the Divergent series at the Schoolcraft College bookstore in Michigan – to name a few! 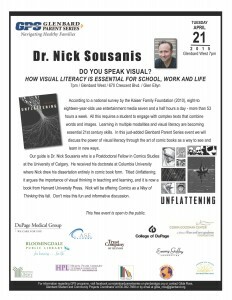 Last week’s post featured some recent interviews including a podcastPublishers Weekly, along with my reflections on doing scholarship in comics form within the academy – that, plus Unflattening already in the classroom here. I’ve been compiling all the news about the book here. This week I’m off to Chicago for the American Education Research Association’s (AERA) annual meeting. I’ll be presenting at a few different sessions all around arts practice as research. 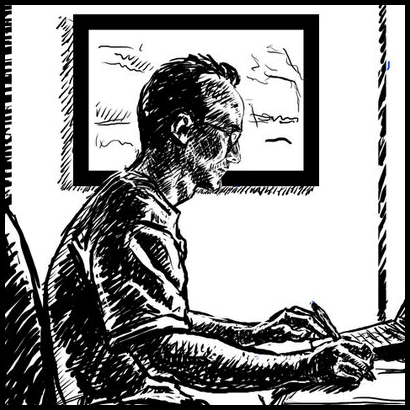 At all of the sessions (or if you find me at the conference), I’ll be handing out mini-comics excerpts of Unflattening. But even better – Harvard University Press will be there at booth #510 – and they will have the book!! I’m thrilled to see a second copy! Conference rundown: On Friday the 17th at 10:35 am, I’ll be co-presenting on a panel on Arts-Based Education Research – a discussion of process and inquiry (29.059 Swissotel Event Centre 2nd Level, St Gallen 2). This is the continuation of a conversation begun a couple years back at AERA around the idea of aesthetic equaling analysis in the sort of work i do. That is, we think about our aesthetic concerns as being as important as our research aims, and both have to work together to generate an authentic work. It’s been really important to my thinking – as reflected in the session from last year – and I’m looking forward to continuing the conversation I’ve been having with Donald Blumenfeld-Jones, now joined by Lexi Cutcher and Joe Norris. Among other things I’ll be discussing on this panel, will be the process sketches behind my page on multimodality, which I posted here a while back. Saturday, April 18th, from 6 to 8 pm, the Arts & Learning Business Meeting will feature a tribute to Maxine Greene (56.014 Hyatt East Tower, Green Level, Plaza A). 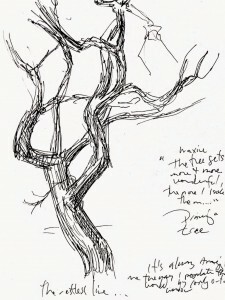 If you don’t know, Maxine was a legendary philosopher of aesthetic education – I was lucky enough to have her as an advisor and had my defense at her home last spring – which would be her final one as she passed just a short time after. 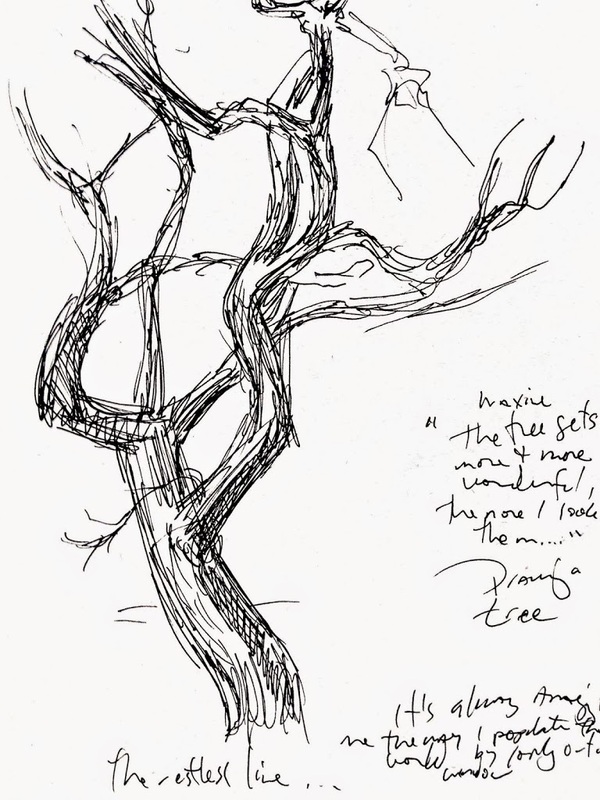 I’ll be among the presenters offering reflections on Maxine, and among other things, I’ll be sharing and doing a rare reading of the collaborative piece I made with Daiyu Suzuki about the tree outside Maxine’s window and her great engagement with it. I showed a page from that here and the whole piece is due out in the TC Record soon, at which point I’ll share it in full here. Finally, Sunday April 19th, at the Arts & Inquiry Business meeting (67.013, Hyatt West Tower, Gold Level, New Orleans), former TC cohort Andrea Kantrowitz, UW-Madison doctoral candidate (in Lynda Barry’s lab!) Ebony Flowers, and I will be taking attendees through some exercises on drawing and thinking in comics. 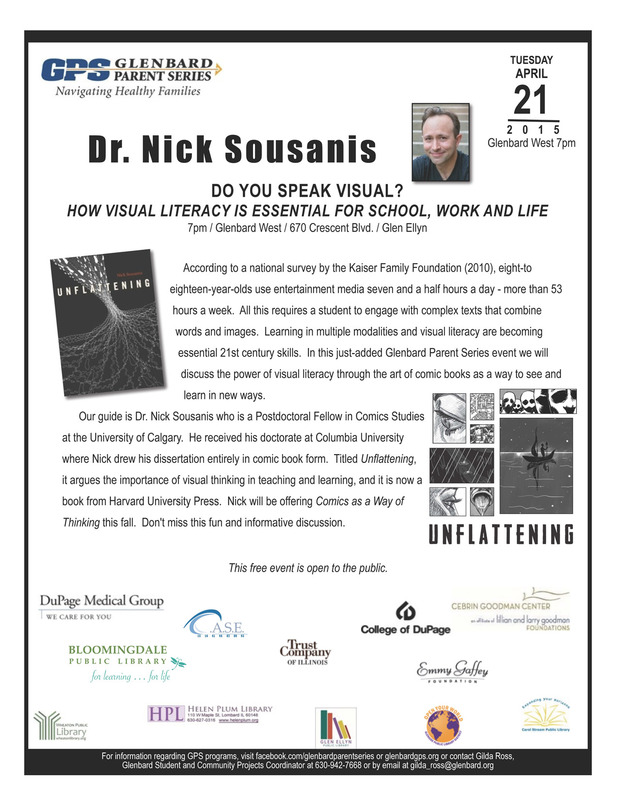 Should be fun and I’m excited to see the different approaches my collaborators will bring to thinking through drawing.